Yesterday, the streets were unusually quiet, even for Sunday, as the Rock ‘n Roll Marathon had closed off portions of 163 and Washington. My wife and I enjoyed a fine walk through what could have been the aftermath of an apocalypse, there were so few people, dogs (being walked) or vehicles. We decide to saunter past the Vermont Street bridge for a peak over the canyon at runners on the highway. 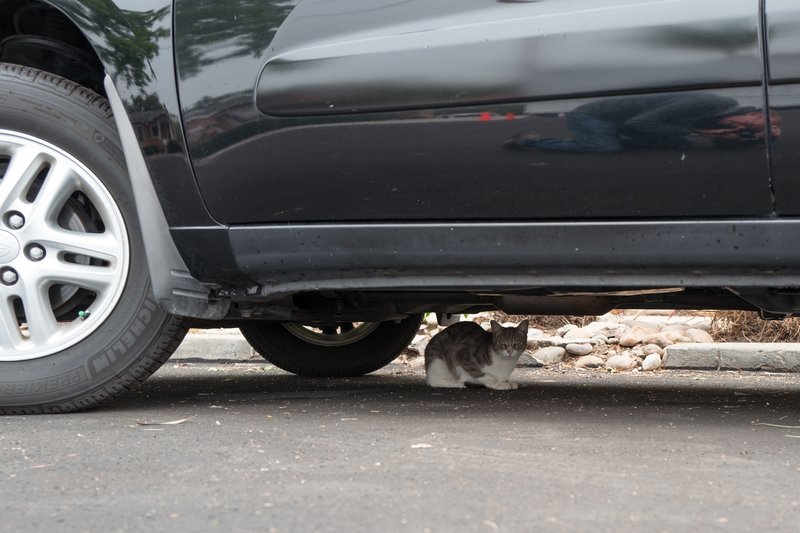 A few blocks on, Annie spotted a cat hiding under a car. The petite feline let me get surprisingly close; I was sure my approach would spook her. The Featured Image is the last of several portraits, shot low to the ground (as you can see from my reflection on the car). The composition is a deliberate crop from an original DNG captured using Leica Q. Vitals, aperture manually set: f/4, ISO 125, 1/60 sec, 28mm. Also in this series: Scruffy, Roly Poly, Woo, Skull, Biscuit, The Colonel, White, Chipper, Frisky, Stretch, Needy, Farfisa, Mates, Hunter, Pee-Pee, Blue, Blue Too, Bonded Pair, Patience, Fess, Jumper, Frenemy, Looker, Cozy, Scout, Lurks, Skit, Mini, Betty, Black and White, Stalker, Bell, Chill, Sammy, Scratch, Poser, Star, Grey and White, Watcher, Herman, Comet, Roman, Willow, Chub, Nimbus, Watson, Lilo, Kit, Pepe, Twilight, Sebastian, Spot, Booger, Ash, Veruca, Riley, Mellow, Bonde, Flower, Glass, Black, BeBe, Fang, Bruce, Siamese, Pounce, Tortie, Haiku, Fraidy, Peso, Daniel Tiger, Dusk, and Stride.